You are now, and forever will be, a Knight of the Ebon Blade, <name>, but know this: you were once a hero of the Horde. This order must establish allies for itself if it is to survive. You must represent the Knights of the Ebon Blade to the Horde. On the platform, southeast of me, is a portal to Orgrimmar. Take this letter, given to me on your behalf by Lord Fordring, and deliver it to High Overlord Saurfang. Use the portal. Deliver the letter to High Overlord Saurfang at Orgrimmar. This quest starts in Eastern Plaguelands and ends in Orgrimmar. 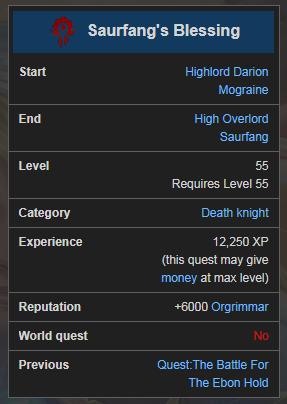 Eitrigg is alive because of this paladin. He would have been executed had Lord Fordring not broken him out of Stratholme. Tirion Fordring, to have sacrificed everything to save the life of an orc... Indeed, this is a rare event. Yes. For Tirion Fordring and for Eitrigg! We will accept you as a member of the Horde and your order as allies. Blood and honor! For the Horde! Players will find themselves outside the gates of a very unfriendly Orgrimmar. Any and all NPCs will show their displeasure and call for a rope or spit or throw rotten food. Characters added to our site after Sept.27 2017 are being held to a new method of tracking quests. You are allowed to complete these quests on your Blood Thirsty Challenger. These are meant to allow you to play your intended class or race and get you access to certain zones, NOT as a method of leveling up. You can complete all quests up to and including the quest where you meet your faction's leader. You can complete all quests up to and including the quest where you witness the teleportation of Dalaran to the Broken Isles: In the Blink of an Eye. You can complete all quests up to and including the quest where you turn in the SI:7 emblem to Saurfang in Orgrimmar: Message for Saurfang. You can complete all quests up to and including the quest where you meet the Pandaren faction leader. You can turn in A New Fate. You can complete all quests up to and including the quest where you destroy the gunship: Endgame. The introduction scenario quests are NOT ALLOWED. To access Draenor, you will need to use the campfire method (there is a campfire in an underwater cave on the Timeless Isle that teleports you to Gorgrond). You are allowed to complete the quest In the Blink of an Eye.